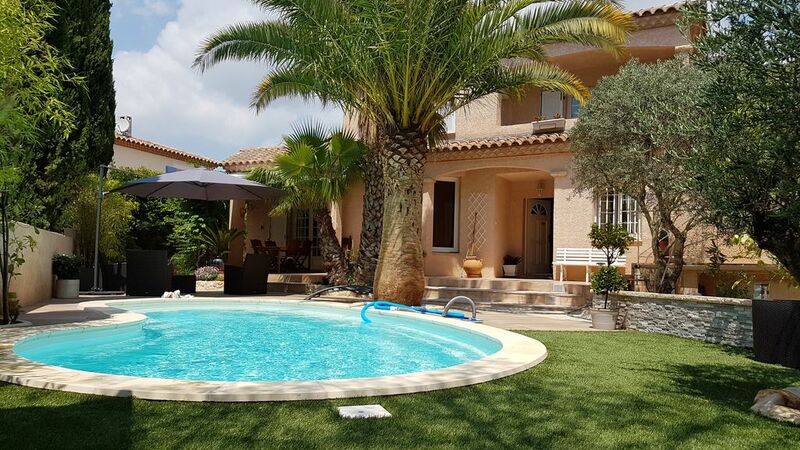 Villa ideally located, in a peaceful environment, 4km from the city center of Montpellier, while being close to the sea, this beautiful villa opens onto a very wooded garden with swimming pool 8x4 - depth 1m50- salt filtration. Close to the large sandy beaches of Carnon, Palavas, Grande-Motte; quick access to the Camargue and the hinterland with its rivers, caves, towns or villages to visit. Very close to all amenities: shops and means of transport. Comfortable villa on ground of 650 m2, heated swimming pool, very raised garden, barbecue, 2 terraces with garden furniture; Super U shopping center at 300m, sea at 12km by expressway, airport at 7 km and motorway access at 4 km. The historic center of Montpellier is only 10 minutes away. Bus 100m, tram 500m. Parking in the garden and 2 private places in front of the house. The villa of 170 m² has on the ground floor a large living-dining room, 2 bedrooms, bathroom with Italian shower, fully equipped kitchen, a toilet, and a laundry room. On the floor: three rooms, room of bath and Toilet. 2 LCD TV, unlimited high speed internet, Wifi, free phone on landline and mobile Europe. We are a family of individuals renting our main residence during the holidays, so occupied by ourselves the rest of the year, and not an agency or any investor ... Photos of the house, the garden, the pool and additional information on request; do not hesitate! (Text automatically translated) From the A9 motorway, exit Montpellier Centre.La house then 5 minutes, between Montpellier and Castelnau-le-Lez.